Is ICD-10 Going to Provoke a Level of Healthcare Insanity? - Outsource Management Group, LLC. Medical Billing » Blog » Is ICD-10 Going to Provoke a Level of Healthcare Insanity? Is ICD-10 going to provoke a level of healthcare insanity? The opinions of a coder. ICD-10 or International Classification of Diseases is designed to create a system where there is compatibility throughout the nation relating to data collection, processing and classification of disease, as well as presenting mortality statistics. The ICD-9 has been revised and as a result, we now have the ICD-10, a whopping three volumes of alphanumeric categories. Some chapters have been changed and rearranged and some conditions have been regrouped from ICD-9. In fact, there is almost double the number of categories from ICD-9 to ICD-10. ICD-10 opponents say that ICD-10 has gone too far, that it is too specific in its codes to the point of ridiculous, such as things like being bitten by a dog or alligator. Let’s look at some of the insanity of ICD-10. ICD-10 can make it nearly impossible to be effective. ICD-10 has 141,000 codes. That’s 8 times more than the 17,000 codes in ICD-9. The additional codes will are going to require doctors and the medical profession in general to be far more specific on claims forms when they are reporting care. In many instances the coding have become so in-depth, it’s to the point of ridiculous. The new system is far more complex and time consuming. While advocates maintain because the new codes are alphabetic and users have access to electronic coding tools to speed things up, the logic behind a structure that is so in-depth that there is a need for 8 times more codes, remains very questionable. The entire process is going to be bogged down and create more paperwork, wasting valuable time that could be used focusing on patient care rather than paper care. Entities that are not covered by ICD-10, will have to transition anyway. Even these non covered entities will be forced to implant the new ICD-10 coding as 1CD-9 will not be supported, creating extra costs and work in industries that are not even directly involved in the medical industry. The depth of the coding will create confusion and additional work, not the opposite. 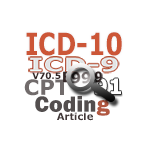 Are claims with ICD-10 going to be way too long and too complex to be useful? The ICD 10 is going to result in super bills that contain diagnostic codes that are so in-depth the bills are going to be beyond the point of usefulness in the detail provided. In addition, it’s going to be more time consuming to complete the process. Here is a good example. A child receives a bite. The medical professional will code the injury according to the newest breakdown, but when the claim now contains a bite, they will now have to specify what kind of bite, such as dog, cat or alligator (yes that’s correct, alligator). There is no reason for this amount of detail on a claim. except that it simply creates a very detailed way of tracking patient’s medical records. Those implementing the new ICD-10 codes will face financial challenges. The cost of implementing ICD-10 will depend on a number of factors, so for some it will cost less than others, but overall this is going to be a very expensive undertaking by all medical facilities. In addition, once it is implemented it may affect the speed at which revenue flows into the practice, because reimbursements could be affected by DRG shifts, accounts receivables could be delayed, and additional staff may be needed to implement and run the new coding system. At the very least, the current staff is going to require training. There may also be a decrease in productivity seen. There is a number of constituencies who will have to be informed and brought on board. ICD-10 requires some entities to be involved in the gathering and processing of such in-depth information that might ot have been so involved in the past, and that can be more difficult. It entails more coordination between health care providers, payers, consultants and vendors along with project teams and it can affect many different levels of staffing. The new ICD-10 codes can at best be considered ridiculous and at worst, a bit insane. The fact that there are 8 times more codes than with ICD-9 is more specific and possibly a move in the right direction, but also very questionable. It’s no wonder there are so many opponents to the ICD-10 implementation.